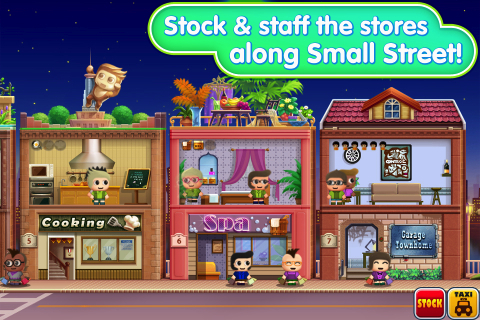 Small Street by Glu Games is a free iPhone app also available for the iPad and iPod touch. It requires iOS 3.1 or later, and is available in both English and Chinese. For this review, we used the English language version on an Apple iPhone 4S. It’s important to note that while Small Street is free to play, there is an in-app mechanism for purchasing additional credits with real money. Small Street uses credits as the in-game currency. Fortunately, there is an application mechanism that allows parents to lock that feature out, and password protect it. In-game credit packages range from $0.99 to $29.99. 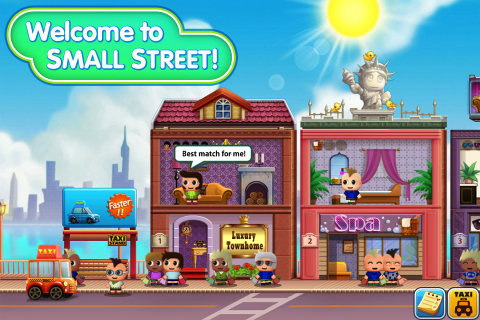 The Small Street app is a streamlined kid-oriented sim game. It puts the player in charge of their own street, and then they’re responsible for building, upgrading, stocking and keeping employees and consumers content. There are five unique business types, including shops, restaurants and apartments, and there are there are forty unique buildings. Like in most sim games, the goals in this application are many, and there are also some sandbox elements, including changing the clothes of the people who populate your street. One of the primary goals is to keep stores stocked and profitable. A secondary goal is to maintain enough housing to meet the need for employees and customers, and there must be dining opportunities so that the people can eat. There are also specialized objectives in the form of tasks and favors. This is the main component that adds unpredictability to each game. It’s also an integral aspect of the achievement system. The Small Street app has GameCenter integration, and you’ll compete against the community on leaderboards and the like. It’s cartoonish and a lot fun, and even though it’s for kids, we enjoyed it immensely. The biggest problem with the setup is that in the multiplayer environment, players willing to spend real money have a significant advantage. If you just plan to play it for free, you have zero chance of competing with the players at the top of the leaderboard. So if you, or your child, have an addictive personality, then Small Street is probably best avoided. If you can enjoy Small Street without the multiplayer, then Small Street is a blast, and it’s free. The only complaint we have in terms of gameplay is the elevator-style theme song that plays over and over. It will drive you batty, but you can disable it, and play your own music instead. Small Street works great on the small screen of the iPhone and iPod touch, and it looks even better on the iPad, although it doesn’t really help in terms of playability. Our bottom line for this iPhone app review is that it’s worth trying, but it can become a money vacuum if you let it. AppSafari review of Small Street was written by Darius Reimm on March 7th, 2012 and categorized under Adventure, App Store, Free, Games, Resource Management. Page viewed 5982 times, 1 so far today. Need help on using these apps? Please read the Help Page.